Believable beauty. 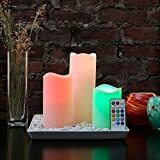 Add the warm and welcoming glow of realistic candlelight to your home decor without any mess or worry of open flames at a brilliant price. 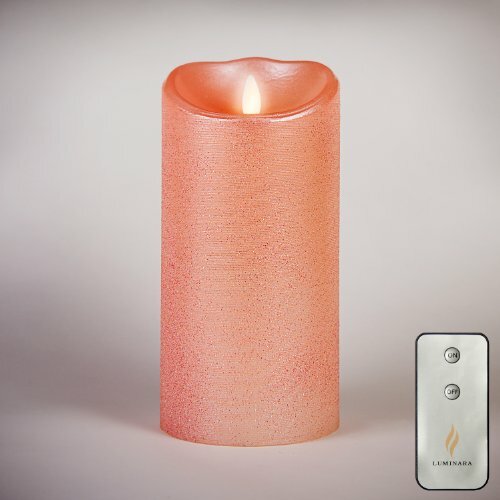 This gorgeous sparkly Luminara battery operated wax pillar flameless candle uses the latest electromagnetic technology to create a random flicker and cast a true light that's incredibly similar to real flame. The romantic ambiance is sure to enhance any area of your home. You can also mix and match with coordinating candles of different colors (sold separately) to create a one-of-a-kind romantic design. The subtle vanilla scent only adds to the atmosphere. 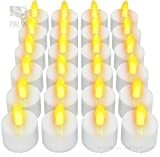 A safe and easy alternative to real candles, flameless candles eliminate the hassles of open flame, smoke, soot, and melted wax. You don't even need to remember to put them out. Candle comes with a remote for easy control at a distance. Just set the built-in timer, and the candle will illuminate for five hours at the same time every day.